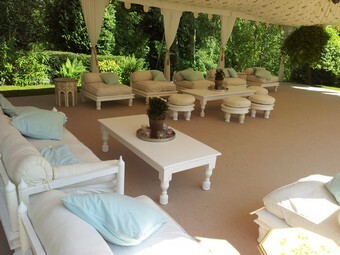 Marquees are the perfect setting to provide versatility for a couple planning to put their own stamp on their big day. They quite literally provide a blank canvas. 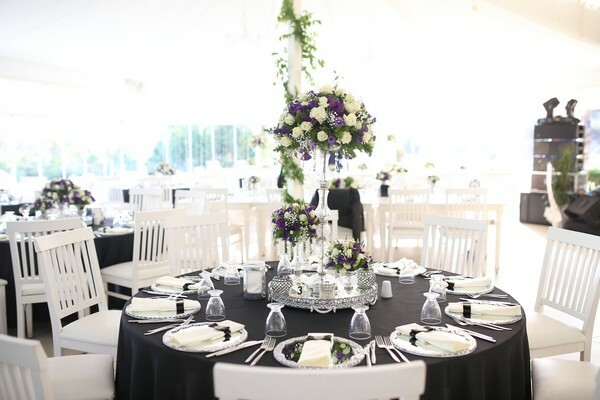 However, not every couple planning a marquee wedding will know exactly how to go about creatively personalising this space, so it is up to you as a venue manager to make their vision come alive. Being faced with a large, empty white space can make it hard for couples to visualise a theme. Where possible, set the venue up for a wedding or event to show what can be achieved. During the initial consultation with the bride and groom suggest they build a Pinterest ‘mood board’ with styles that they like, draw on experience of other weddings they have attended and look at the venue website, brochure and social media to see what has been done previously. Wedding magazines and blogs can also be a good source of inspiration as well as asking other couples about their experiences. It is beneficial to build relationships with wedding photographers and to ask for permission to use the images for your own purposes in order to show the potential of your venue. A picture paints a thousand words. Share your experience of previous weddings at your venue, and tell the couple what works and what doesn’t. Don’t push ideas onto them but guide them through the practicalities of theirs. We encourage the bride and groom to give us all the details of what they want for their wedding day, no matter how insignificant or unachievable they think they might be. People envisage the memories that they will have from the day before it has even happened, and we want to make them a reality. We work with venues to identify certain features that can enhance the appeal of their marquee site in order to make it stand out. We are currently seeing a rise in the number of lakeside locations, with stately homes using the estate parkland as well as the house for wedding receptions. Carlton Towers in Yorkshire is a quintessentially English estate in a natural countryside setting. The grounds boast a historic 11 acre lake with its own private island, which is home to ducks and swans, lending itself to an elegant, yet relaxed wedding theme. A marquee can be erected almost anywhere, whether it is in a field, a garden at home or even on the beach. However, the couple will make the emotional connection with the venue itself and the surrounding area. Promote the history of your venue, pointing out unique, quirky or interesting features. These elements are what make your venue different and they can also form a basis for the theme. Bolton Abbey is one of our newest venues and we find that a lot of our couples choose to marry there because it evokes fond family memories. There are many different and interesting marquee options, from Tipis for more intimate weddings, Indian tents and Sailcloth marquees that offer uninterrupted, panoramic views to the traditional aluminium frame marquee. 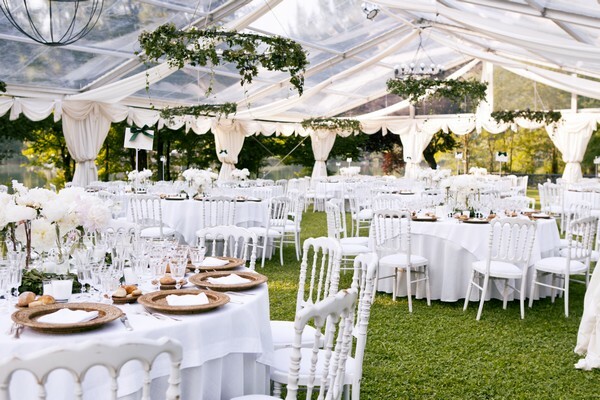 Each one can complement or contrast the venue style depending on the chosen theme. Sailcloth marquees are very popular for venues with attractive views as the translucent fabric and floor length windows allow the location to become the feature, lending itself to a simple, clean and elegant theme. However, a Tipi gives a more rustic feel that could offer a unique contrast by being located in a country estate and placing elegance and informality side by side. Anything goes with a marquee wedding. The main restrictions are of course no open flames unless set within an appropriate candle holder and no fixtures on the walls, but other than that pretty much anything can be achieved. The lack of accommodation can be a stumbling block for people who want a marquee wedding. However, having accommodation at your venue or teaming up with a local hotel could solve this problem. Popular themes at the moment are vibrant, block colours that really stand out and make a statement against the clean, white background of a traditional marquee. This can be achieved with furniture, flowers or even just the linen. For the quirkier tents, couples are requesting mismatched furniture, tables and chairs, and casual sofas in brightly coloured fabric for a seating area. We recently set out a marquee with Perspex chairs, which gave a very modern feel. Furniture is key to bringing a theme to life. The bar can also be a central focus; we have done everything from a back lit bar, a bar incorporating a crystal chandelier, a bar covered in foliage and moss and even a bar in a canoe. We find that it’s now trendy to buck the trend and couples are making their wedding day their own by not following wedding traditions, whether this is down to the format of the day, the food or the theme. Lighting is an important element of theming of a marquee, whether its backlit draping, fairy lights or chandeliers inside or lanterns leading the way to the marquee entrance outside. Lighting can add the perfect ambience to the day. It also transforms the look of the venue from day into evening. Once the theme starts coming together, the next stage is sourcing the different suppliers to execute it. We have a recommended list of suppliers for flowers, cakes, entertainment and venue dressing that we share with every couple. This offers security to both the venue and the client, ensuring that the supplier is reliable and familiar with the site. Through working with suppliers you can also build mutually beneficial relationships. If they are on your recommended list, then you should be on theirs. These relationships can also be useful for joint marketing activity. Being proactive on social media, sharing images (with permission from the couple) of the weddings and highlighting the suppliers used will hopefully encourage them to do the same and help to raise awareness of your venue with new audiences. Rustic, nature-inspired décor is as popular as ever and this looks set to continue into 2017. Bringing the outside inside is perfect for a marquee wedding. Branches and lanterns for centrepieces, wild flower bouquets, grass-inspired table runners and natural wood elements all add to the rustic theme. Whimsical weddings are also a popular choice with couples taking inspiration from their favourite films or childhood books. This theme is perfect for a woodland setting. The use of giant balloons, brightly coloured paper pom pom decorations, flower crowns and an abundance of foliage create a dreamlike feel for the day. The most popular theme we see is Alice in Wonderland, which can throw up some really fun ideas such as a Mad Hatter’s tea party, vintage tea cups, wedding favours embellished with ‘Drink me’ or ‘Eat me’, colourful cake tables and décor that includes playing cards, rabbits, clocks and Cheshire cats. The traditional vintage and romantic themes are still chosen regularly, but couples are definitely adding more personality to their big day through the theme. We recently managed a wedding in a marquee at home that drew on the couple’s love of horses. The cake replicated their own horses, they used horse racing themed table numbers and the couple’s transport was, of course, a horse and cart. People are also using photography and nostalgia within their themes; childhood photographs and home videos, images of parents and grandparents getting married as well as having a major focus on pictures being taken on the day whether using a photo booth with props or providing selfie sticks on each table. The use of a projector to show photographs and film is also very popular and effective during the evening against a marquee backdrop. At Dine, we work with a wide range of venue owners, offering advice on overall business plans and hospitality services. We manage over 200 weddings each year across our venues as well as at clients’ homes. The beauty of a marquee wedding is that no two weddings will be the same. I love that every couple comes with their own vision for the day, which can transform the space into the wedding venue they had always imagined.